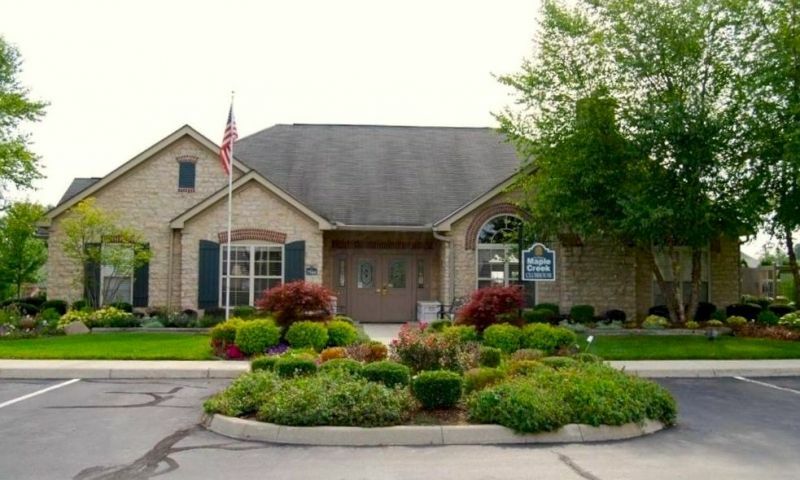 The Villas at Maple Creek is an active adult community located in Westerville, Ohio. This charming neighborhood was built by Epcon Communities and offers 55+ homebuyers low-maintenance attached homes on a resale-only basis. Homeowners have access to a quaint clubhouse with great indoor and outdoor amenities. Residents also have plenty of activities to join along with neighbors, which is sure to keep their social calendars busy. Residents of The Villas at Maple Creek can enjoy the charming clubhouse that’s the central hub of social and physical recreation. Homeowners can stay healthy by working out in the exercise room. They can hang out in the comfortable social room equipped with a television, billiards and card tables where residents can play pool, poker or watch a movie. There is also a catering kitchen that’s great for making snacks for a party. The library is a great place for some quiet time to read the latest novel. The Villas at Maple Creek provides outdoor amenities as well. Residents can swim a few laps in the pool, relax on the spacious patio, or take a stroll along the neighborhood’s walking trails. The scenic ponds and natural open space also accent the landscape of The Villas at Maple Creek. Epcon Communities built The Villas at Maple Creek from 2003 to 2005 with 152 attached homes, which are currently available on a resale-only basis. Homebuyers aged 55 and better can choose from four spacious models such as the Villa, Abbey, Canterbury, and Chateau. All homes offer one-story story living except for the Chateau, which has two floors. These ranch-style homes range from 1,324 to 1,926 square feet of living space. Attached homes have one to three bedrooms, two or two-and-a-half bathrooms, and attached two-car garages. Homes feature garden style patios or sunrooms, vaulted ceilings, gourmet kitchens, elegant master suites, plenty of storage space, and energy-efficient designs. The homeowners’ association (HOA) fee includes maintenance for exterior of the homes, common areas and landscaping. Residents living in The Villas at Maple Creek have more time to do fun things because they don’t have to worry about exterior home chores. Instead, homeowners can join activities and events held at the clubhouse. Some of those include cards night, dominoes, men’s billiards, movie night, coffee and conversation, and other community parties. An active social calendar will keep residents entertained as well as foster friendships between neighbors. The Villas at Maple Creek is conveniently located in Westerville, Ohio. Residents have easy access to Interstates 71 and 270, which is only 14 minutes away from the community’s entrance. Shopping and entertainment options can be found at Polaris Fashion Place that’s less than ten minutes away. Outdoor lovers can enjoy Sharon Woods Metropolitan Park, which is an eight-minute drive. For big city attractions, homeowners can drive to Columbus or board a flight at Port Columbus International Airport that’s only 22 minutes away. The Villas at Maple Creek in Delaware County is a great place for 55+ homebuyers who want to have an active and social lifestyle. There are plenty of activities available in The Villas at Maple Creek. Here is a sample of some of the clubs, activities and classes offered here. Epcon Communities built The Villas at Maple Creek from 2003 to 2005 with 152 attached homes which are currently available on a resale-only basis. Homebuyers can choose from four spacious models such as the Villa, Abbey, Canterbury, and Chateau. All homes offer one-story story living except for the Chateau, which has two-floors. These ranch-style homes range from 1,324 to 1,926 square feet of living space. Attached homes have one to three bedrooms, two or two-and-a-half bathrooms, and attached two-car garages. Homes feature garden style patios or sunrooms, vaulted ceilings, gourmet kitchens, elegant master suites, plenty of storage space, and energy-efficient designs. 55places.com is not affiliated with the developer(s) or homeowners association of The Villas at Maple Creek. The information you submit is distributed to a 55places.com Partner Agent, who is a licensed real estate agent. The information regarding The Villas at Maple Creek has not been verified or approved by the developer or homeowners association. Please verify all information prior to purchasing. 55places.com is not responsible for any errors regarding the information displayed on this website.